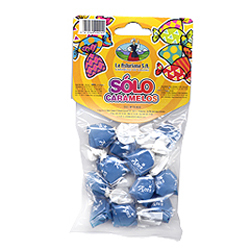 Hard candies, with a citric flavor. 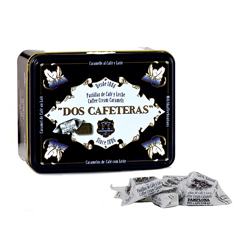 Artisan coffee candies made with first quality ingredients, with a recipe from 1886. 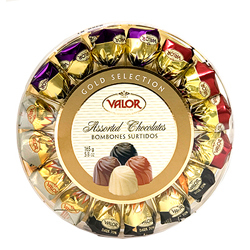 In 1989, Senador Valero and wife Felipa Nieva came up with this decadent confection. Being from a town in Caceres, Spain, where figs are abundant, the combination of flavors seemed a perfect match. That is how 'Rabitos Royale' were born. 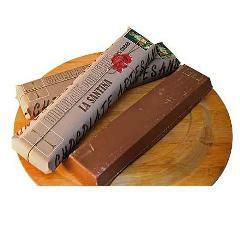 Their family company 'La Higuera' continues the tradition. The best figs are selected according to size and sweetness. They are filled with a brandy infused chocolate truffle, and then covered in a thin layer of dark chocolate. Ingredients: sugar, glucose syrup, jam (5%) and permitted essences. Cocoa from Ghana, Panama and Ecuador wisely combined give rise to this maximun exponent of chocolate. 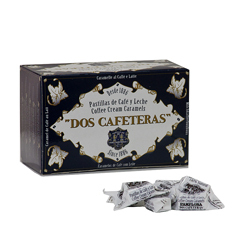 Dark and with a pronounced flavor and aroma of cocoa (70%) make this the favorite of true chocolates lovers. 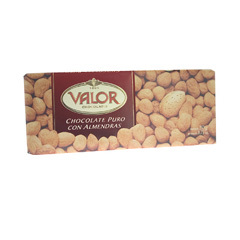 This pure dark chocolate of intense flavor leaves a prolonged after taste and it is combined in this variety with the best marcona almonds. (May contain traces of nuts and milk). In this variety, you will find sophisticated chocolates alaborated by chocolate master, with a variety of exquisite fillings which will result exquisite to the most demanding palate: almond heart, dark 70% with orange, chocolatisimo hazelnut and milk chocolate cream. 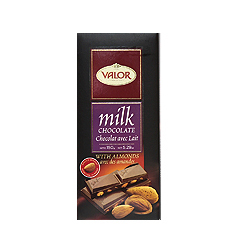 One of the most reknowned chocolates in Spain, 'Valor' brings us a delicious dark chocolate bar with almonds from an ancient recipe.Valor only uses whole almonds from the marcona variety the ones that have made world wide famous the exquisite turrón de Alicante. 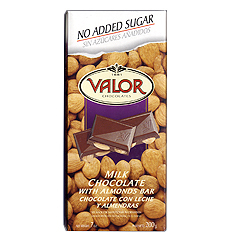 Milk chocolate is combined in this variety with the best marcona almonds. (May contain nut and milk traces). No need to grate! 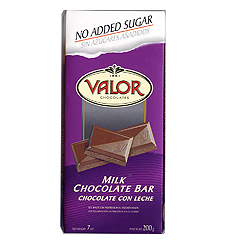 'Valor' is a well-known chocolate brand in Spain. 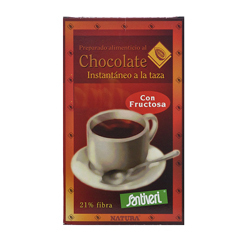 Keeping an ancient recipe, this solid dark chocolate bar makes a delicious chocolate brew, when stirred in a saucepan of boiling milk for a few minutes. 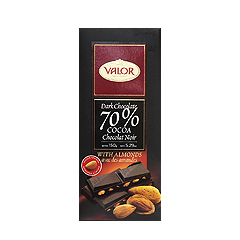 Dark and with a pronounced flavour and aroma of cocoa (70%) make this the favourite of true chocolates lovers. (May contain nuts and milk traces). 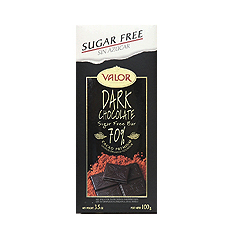 'Valor' has achieved a line of SUGAR FREE chocolate bars of the same quality and flavor as that of its traditional pure chocolate. Ideal for diabetics or simply for those who wish to take care of their figures, and don’t have to deprive themselves of the best chocolate. Marcona almonds are used to make this delicious chocolate. All the flavor of our best pure chocolate with no added sugar. 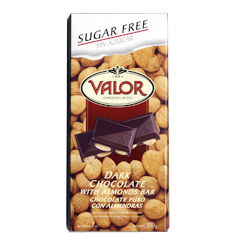 'Valor' has achieved a line of SUGAR FREE chocolate bars of the same quality and flavor as that of its traditional pure chocolate. Ideal for diabetics or simply for those who wish to take care of their figures, and don’t have to deprive themselves of the best chocolate. All the flavor of our best pure milk chocolate with no added sugar. All the flavor of our best milk chocolate and almonds of the marcona variety, with no added sugar. Drinking cocoa mix 'Santiveri' is perfect for breakfast or with a mid-afternoon snack.